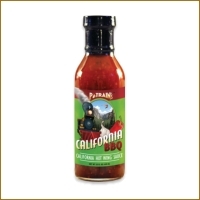 P Train’s California BBQ Sauces draw from the unique culture and flavors that are available in California, from the spicy flavors that originated in the Far East, South American and African cultures to the complexity of flavors that originated in the Mediterranean. You will find the flavor and texture of all our sauces to be quite complex complete and delicious. Great Tasting BBQ has never been so easy, simply grill your meats and add your favorite P Train’s California Sauce and serve. You guests will be thrilled and so will you. P Train’s Original BBQ Sauce is a tomato base, sweet savory barbecue sauce that will add a full body of flavor to your favorite meat and veggie dishes. We have taken all natural fresh locally grown California products and blended them together to enhance any barbecue dish. P Train’s original barbecue sauce goes great on ribs, chicken, chops, hamburgers, hot links, barbecue meatloaf, barbecue baked beans and the list goes on. For those of you who like your sauces on the side. 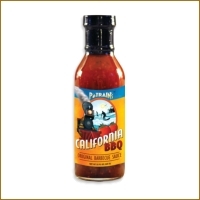 P Train’s Original California BBQ Sauce is a rich smooth sauce that is perfect as a dipping sauce. This includes two 15 fl oz bottles off P Train’s Original BBQ Sauce. P Train’s California Hot Wing Sauce is California’s version of Buffalo Wing Sauce. Like traditional Sauce our California Wing Sauce has a red pepper & Vinegar base, but that is where the similarities end. We have created a Unique Blend of “Sweet Heat” that is followed by a flavorful layer of garlic from Gilroy California. P Train’s all natural Hot Wing Sauce not only tastes great on California grilled hot wings, also try it on eggs, breakfast burritos, stir fry, egg rolls and much more. Your imagination is the limit. If you prefer your sauce on the side P Train’s California Hot Wing Sauce is a great dipping sauce too. This includes two 15 fl oz bottles off P Train’s California Hot Wing Sauce.